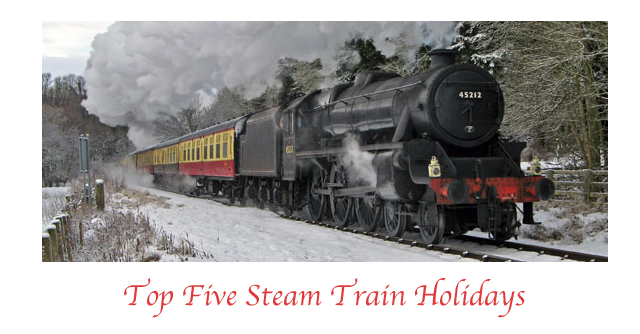 Steam train holidays offer a relaxing, peaceful alternative to the traditional vacation. They give you a chance to escape your hectic day-to-day life and immerse yourself in a calm environment, while making your way through some of the world’s most stunning, natural vistas. With so many breathtaking steam train holidays to choose from it can be difficult to choose one, so here are our top five. A steam train holiday through Yorkshire is a truly memorable experience, offering holidaymakers the unique opportunity to pass through the rolling hills of the North York Moors National Park, relax in the idyllic seaside town of Whitby and explore the historic town of York. The natural wonder of the Moors and the Pennines are merely the starting point for what promises to be an unforgettable journey. Visiting York’s Jorvik Viking Centre is one of many must-see attractions that will give you an insight into the city’s rich history. Wales is home to some of the most striking, mountainous scenery in the United Kingdom and there’s no better way to survey the land than from aboard one of the region’s traditional steam trains. Wales is teeming with charming villages, such as Portmeirion and Llanberis, while the military history buffs amongst you will be mesmerised by the beauty and intrigue of Caernarfon Castle, a UNESCO World Heritage Site, which is the home of the Regimental Museum of the Royal Welsh Fusiliers. While your preconceptions of Scotland may be confined to the image of cosmopolitan Edinburgh, a trip through the Highlands of Scotland unearths much more than you may have anticipated. Venturing into the Highlands through the Cairngorm Mountains promises to be an adventure that you’ll treasure forever. The Highlands are littered with quaint villages, set against stunning backdrops, while a trip to Queen’s View, one of Scotland’s most beautiful panoramas, must be experienced while on your journey along the rails. Characterised by meandering waterways and stunning landscapes lined with life, travelling from Norwich to Norfolk by steam train is an utterly spellbinding experience. In addition to the beautiful scenery, attractions include Norwich’s Anglican Cathedral and the opulent Sandringham House, one of the Queen’s favourite country residencies, with its lush gardens. If you’re looking to explore a little farther afield than the UK, taking a steam train through Northern Germany’s Harz Mountains is a wonderful option. The mountains of Harz make a breathtaking backdrop against which to explore the north of Germany by rail. The UNESCO World Heritages Sites of Goslar and Quedlinburg, where the streets are adorned with half-timbered houses, are unparalleled in their beauty, as well as being home to a hilltop church and an menacing-looking 10th century castle. While north Germany’s towns are charming, a trip through the Harz Mountains is all about natural beauty. A trip along the narrow-gauge Brocken Railway, takes you all the way to the summit of Brocken, the Harz Mountains’ highest peak, for a view that will certainly leave a lasting impression.